South Africa. Now also comes from Egypt, Morocco, France, Italy and Spain. The Rose Geranium from the Reunion Islands, called “Bourbon”, is considered the best. Leaves and sometimes leaves and flowers. The leaves can be used in baked goods, fruit preserves and to flavor sugar. Sweet, floral, rose-like scent with a hint of citrus, mint and spice. 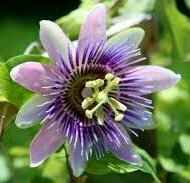 Used often in perfumery because of its pleasing scent. Analgesic, antibacterial, antidepressant, antidiabetic, anti-inflammatory, antiseptic, astringent, cicatrizant, deodorant, dilates bile ducts of liver for detoxification, diuretic, emmenagogue, hepatic, insecticide, regenerative, rubefacient, sedative, styptic, tonic, vasoconstrictor, vermifuge, vulnerary, insect repellant. Uplifts, calms, soothes, relaxes and balances. Good for grief, shock, trauma, anxiety, depression, nervous exhaustion, stress and insomnia. Reconnects us to our emotions, spontaneity, creativity and ability to feel pleasure and enjoyment. May help release negative memories. Provides spiritual protection. Enhances relationships helping to return to love. Assists in the return to conscious awareness. Balances hormones (do NOT use while pregnant), adrenal gland stimulant, aphrodisiac, regulates blood pressure. Good for nervous tension, stress, PMS, menopause, menstrual cycle irregularities, fluid retention, breast engorgement, circulatory problems (improves blood flow), liver problems such as jaundice, hepatitis and cirrhosis, gingivitis, digestion, insomnia, stress headaches, neuralgia, pancreas imbalances, lymphatic congestion, diarrhea, gall stones, nose bleeds and other hemorrhaging and sore throat. Regenerates tissues and nerves. Heals wounds by reducing inflammation and infection. Good for cellulite, insect bites, eczema, acne, burns, scarring, stretch marks, enlarged veins, lice, shingles, ringworm, herpes, rosacea, broken capillaries, hemorrhoids, inflamed skin, dry skin, mature skin and sebum balance. Delays wrinkles. Helps cuts to stop bleeding. Insect repellent. Do NOT use while pregnant. Consult with your physician if you have adrenal gland issues, because Rose Geranium stimulates the Adrenal Cortex. Let us take a rest and enjoy nature. before using any essential oils. Aromatherapy is one of the fastest growing industries in the new millennium, gaining wide popularity in the United States. From scented candles to fragrant massage oils to hydrating skin care to scented bath & shower products, aromatherapy has captured the attention of the American public. CAUTION: Please BEWARE of products with scents that are laboratory made! Most grocery store products are not made of 100% pure essential oils or extracts. These products have no healing properties at all. In fact, they can potentially harm your health. READ THE LABEL and buy from a reputable company!!! See my recommendations for purchasing oils at the bottom of this page. Essential oils have both a physiological and psychological affect. They have the potential to detoxify and heal the physical body, as well as release and balance thoughts and emotions, and open pathways to higher consciousness. Physically, essential oils have the potential to alter bodily processes, oxygenate the brain, and restore normal functioning of the physical body. Most directly affect the nervous system and are antibacterial, and many are antiviral, antiseptic, anti-inflammatory, immune-supportive, and more. And yet they also have an effect on the mind, emotions, and spirit, which interestingly is the direct result of their ability to physiologically change the central nervous system and key brain centers. Subtle Aromatherapy is intended to primarily affect the mental, emotion and spiritual aspects of the individual, addressing issues such as healthy lifestyle, stress relief, promoting relaxation, mental focus & clarity, fatigue, depression, meditation and exploring higher states of consciousness, however, physical bodily systems are also affected. Only essential oils of the purest, highest frequency can be used and these 100% pure essential oils are called 100% pure THERAPEUTIC-GRADE essential oils. Ah... a fragrance washes over you and suddenly you are transported back in time to a treasured moment from long ago.... That is the beauty, the essence, the miracle of subtle aromatherapy. Organic aromas such as freshly baked bread, a newly mown lawn, the salty sea air, or the sweet smell of the earth after a rainfall fill our everyday lives. This is our sensory world of smell, which is one of the ways our system gives and receives information. Aromas have the power to alter our physical body's chemistry, our emotions, our thoughts and mental outlook, and our sense of spiritual connection. 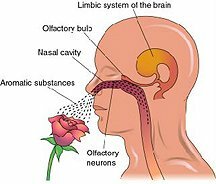 Aromas are received through the olfactory system of the nose. The olfactory membranes under the bony covering of the nose contain hundreds of millions of extremely sensitive nerve endings for receiving and processing arom as. Microscopic vaporized oil particles from every organic substance enter the nose and float along specialized cilia which differentiate each chemical and respond in kind by generating a unique code of nervous impulses which are received by the central nervous system. These impulses then begin a long but momentary journey. First they are carried to the Limbic Mid-Brain (the center of our emotions and memories), and then to the base of the brain, which is the pathway between the spine and higher brain centers, passing between the pituitary gland (switchboard of the endocrine system and ALL emotions) and the pineal gland (regulator of our biological clock and stimulates our inner vision) and then to a little known part of the brain called the amygdala, which stores and releases emotional trauma. Finally the impulses complete their journey by entering our gustatory center of the brain, which is our taste perception. When an diluted essential oil is rubbed on the bottom of the foot (always diluted, never neat), you will taste it in about 5-15 minutes! It is no wonder aromas create such a biological and emotional response! The molecular chemistry of the essence of a plant, its essential oil, is diverse and complicated. Each chemical constituent creates a singular effect. For example, oils containing sesquiterpenes, such as Frankincense and Sandalwood, are able to pass the blood brain barrier in the brain, allowing oxygenation of the pineal and pituitary glands. "In studies conducted at Vienna and Berlin Universities, researchers found that sesquiterpenes in the essential oils of sandalwood and frankincense can increase levels of oxygen in the brain by up to 28% (Nasel, 1992). 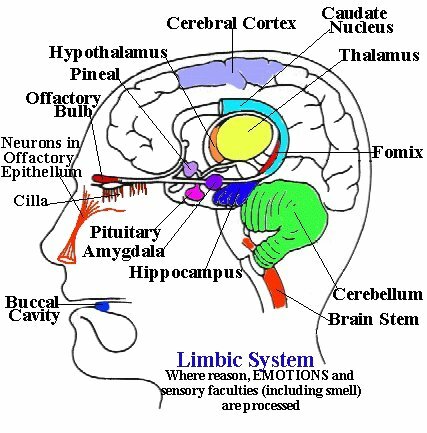 Such an increase in brain oxygen may lead to a heightened level of activity in the hypothalamus and limbic system of the brain, which can have dramatic effects not only on emotions, learning, and attitude, but also on many physical processes of the body, such as immune function, hormone balance, and energy levels. High levels of sesquiterpenes also occur in Melissa (Lemon Balm), Myrrh, and Clove oil." From "Essential Oils Desk Reference". When a combination or blend of essential oils is created, the synergy of the many constituents unique to each plant’s essential oil is powerful indeed. With a essential oil blend, one must fully understand not only the effects of each singular essential oil, but also the resulting effect of the synergy of the combination of essential oils. The gift of essential oil blends is that a unique combination of essential oils can be made specifically for one's needs. When applied to the skin, the plant’s life-force is absorbed into the body’s fluid systems which eventually circulates through the organ and glandular systems of the body and eventually through all fluids and tissues of the body. The foot is the most porous of all the body's skin. Rub a clove of garlic on the bottom of your foot and in about 5 minutes you will taste it in your mouth and “feel” the sensation in your nose! Diluted essential oils (never apply neat oils to the skin) applied to the feet, the most porous part of the body, travel throughout the body and affect the cells, including the hair, in just 5-15 minutes! There is no doubt that essential oils through inhalation and the direct application to the skin affect not only the physical body, but the mind, emotions and spirit. The potential for healing is enormous with therapeutic-grade essential oils. We are only beginning to understand their power and effectiveness. After reading all the Usage & Cautions of essential oils, I invite you to explore and experiment with the oils. Remember, go slow, inhaling or applying only one or two oils at a time. Oils should never be applied "neat" to the skin, which means undiluted; they should always be diluted in a preferably organic carrier oil such as almond, jojoba or grapeseed oil. Savor each oil and give each one time for its voice to speak to you. Soon, you will know the oils intimately. Enjoy! More useful information from Nature's Garden and Aurora Health Care. WhiteLotusAromatics - high quality 100% pure absolutes, genuine attars, ruhs and natural blends. Many rare oils. Wholesale prices (minimum order $100). Vast amounts of information and perfume recipes in their newsletter vault primarily for perfumers with an emphasis on the oils of India. Christopher McMahon and his wife Suzanne have spent years travelling in India to gain a practical understanding of the inner workings of India's ancient and modern fragrance industry. You can spend hours learning from the website's wealth of information. Has great contacts with distillers all over the world. Great personal customer service too. ArtisanAromatics - They carry a few lovely exotic floral enfleurage oils, which are truly outstanding. They offer other very high quality pure oils as well. Customer service is excellent. Highly recommend them. Based in Western NC. Nature's Gift - Marge Clark's site with 100% pure essential oils, absolutes and extracts directly sourced worldwide. She has an intimate relationship with distillers and distributors. Also Marge sells blends, hydrosols, butters, waxes, carrier oils, salts, and supplies. Lots of useful information there. Have loved everything she sells. Excellent products, but has become very expensive. She has a practitioner discount, but only if you have a STATE LICENSE. That rules me out since I no longer pay those hefty annual dues anymore. Lotus Garden Botanicals - This is a fairly recently discovered company in many respects. I ordered some hydrosols many years ago, but didn't try their oils until early 2016. Wow, what a great experience! Very personal service and the quality of the oils I received are superior! I got a very expensive and rare Pink Champaca, and it is a delight! Pricey oils, but worth it for the rare oils. I highly recommend this company. Currently, if you review an item purchased, you will receive a 15% discount on your next order placed within about 20-30 days. Miracle Botanicals - A lovely company on Hawai'i island whose connection with Gaia is deep and abiding. I've thoroughly enjoyed all the essential oils I've purchased from them. Customer service is excellent and their sources are good. They are in need of support due to the covering of their land (aina) and home with lava from the May 2018 Pele eruption. Aftelier Perfumes - This is Mandy Aftel's website, which is aimed at perfumers and chefs. High quality 100% pure essential oils, absolutes, extracts, natural isolates, compounded natural isolates and other perfumer's botanicals. Select line of natural perfumes, which are truly amazing. She also offers a course in Natural Perfumery. Mandy Aftel published an excellent book on making all natural perfumes called "Essence & Alchemy: A Natural History of Perfume", which I highly recommend if you want to make blends for scent. Hermitage UK - Good quality 100% pure. Most oils are very nice, but you are paying for UK high currency exchange rates. Also something I do not like is that they bottle everything in the same 10ml bottle, so if you purchase a small quantity, say 1 or 2ml, it will have a large air space which will degrade the oil more quickly. But they do have some oils you cannot find anywhere else and sometimes at a good price. ScentsOfEarth - have purchased VERY high quality old/original Mysore Sandalwood, as well as Blue Lotus absolute (Nymphaea caerulea; proper name is Blue Water Lily). Their Blue Lotus Attar from Thailand sends me into ecstacy, but they have been out-of-stock for quite some time, so I don't know if they will get anymore in. I think it might have been a one-time distillation. Prices are high, but quality of these 3 oils is superior. Have tried some of their Frankincense's too and they are quite nice. Motia Attar nice. Not sure about their other oils, but probably all good, because they specialize in the exotic oils of India and the Middle East. However, they seem to concentrate on incense and resins. Some of their prices are quite high, so be prepared; there are usually good alternatives at the other links I have supplied here. Bodybliss - Affordable 100% pure essential oils. Organic, wildcrafted and sustainably obtained. Practitioner discounts available ($100 minimum). Now catering more to spas than professionals, so their variety is not as good as it used to be, but they strive to find best-quality, sustainable oils. I have known the owner of this company since the beginning and they have very high integrity. EdenBotanicals - mostly high quality 100% pure essential oils, absolutes and extracts. Information primarily for perfumers. Most are quite nice, but some definitely bomb. I suggest getting samples before buying larger quantities. And if you find you like the sample, order quickly, because their various batches can be like day and night in their quality. LibertyNatural - essential oils, absolutes, extracts, attars, resins, concretes, distillate waters, waxes, herbs, tinctures, supplies and more at very affordable wholesale prices. However, many I've purchased are not very good, so I suggest you buy samples first.. No oil information except C of A (Certificate of Analysis) and/or MSDS (Material Safety Data Sheet). Mountain Rose Herbs - organic and sustainable essential oils, herbs and supplies. I have ordered from them and some good, some not so good. I think their quality has gone down over the years, although many people swear by them. I think it's just because they don't know about the other resources available. They do have a nice variety of herbs and supplies, which is what I mostly buy from them. WhiteLotusAromatics - voluminous number of articles, especially for India's essential oils, absolutes and CO2 extracts. Excellent information for perfumers. I have purchased their oils and they are 100% pure. AromaWeb.com Resources and Information: excellent book list, recipes, articles and more. EssentialOils.co.za - a lovely site in South Africa with lots of excellent information. 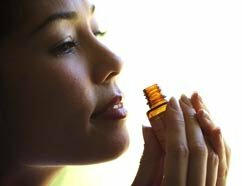 AnandaApothecary.com Useful generic information about each essential oil. *The Complete Guide to Aromatherapy (Second Edition), Salvatore Battaglia, The International Centre of Holistic Aromatherapy, 2003 The Aromatherapist's Therapeutic Bible! *Perfume and Flavor Materials of Natural Origin, Steffan Arctander, Allured Pub Corp., 1994 The Perfumer's Bible! *Essence & Alchemy: A Natural History of Perfume, Mandy Aftel, Gibes Smith, 2004 Best book to learn the ancient art of perfumery! The Art of Aromatherapy , Robert B. Tisserand, Healing Arts Press, 1977. Aromatherapy Workbook , Marcel Lavabre, Healing Arts Press, 1990. Aromatherapy: A Complete Guide to the Healing Art, Kathi Keville & Mindy Green, Crossing Press, 2009. The Encyclopedia of Essential Oils , Julia Lawless, Element Books Limited, 1992. The Complete book of Essential Oils & Aromatherapy , Valerie Ann Worwood, New World Library, 1991. Aromatherapy An A-Z , Patricia Davis, C. W. Daniel Company Limited, 1988. Subtle Aromatherapy , Patricia Davis, C. W. Daniel Company Limited, 1991. Aromatherapy for Healing the Spirit: Restoring Emotional and Mental Balance with Essential Oils, Gabriel Mojay, Healing Arts Press, 1997. The Fragrant Heavens: The Spiritual Dimension of Fragrance and Aromatherapy, Valerie Ann Worwood, New World Library, 1999. Colour Scents: Healing with Colour & Aroma , Suzy Chiazzari, C.W. Daniel Company Limited, 1 Church Path, Saffron Walden, Essex, CB10 1JP, United Kingdom. Your Essential Nature: A Guidebook of Essential Oils for Energy Workers , Nita Morrow Hill, Nita Morrow Hill, Box 771739, Memphis, TN 38177-1739. Reference Guide for Essential Oils , compiled by Pat Leatham & Connie Higley, Abundant Health, 1460 N Main ST #9, Spanish Fork, UT 84660, 1996. Call 888-718-3068 to order. Aromatherapy: The Essential Beginning , D. Gary Young, N.D., Essential Press Publishing, 1995. The Healing power of Essential Oils , Rodolphe Balz, Lotus Light, 1995. The Complete Book of Incense, Oils & Brews , Scott Cunningham, Llewellyn Publications, 1991. The Aromatherapy Book , Jeanne Rose, North Atlantic Books, 1992.
www.energyandvibration.com and its distributors accept no responsibility for such use. electronic, mechanical, photocopying or otherwise, without prior written permission from Anne Christine Tooley.